As delighted as you are by a piece of candy, until now, you have probably been rather content with picking up a bar or bag from your local grocery store whenever a confectionery craving sets in — that is, until now. There are a handful of confectioners, chocolatiers, and sweet treat masters that can transform sugar into pure magic. The United States boasts some of the world’s best and brightest candy shops, from a pepper candy shop dating back to the turn of the 19th century to a massive warehouse full of floor-to-ceiling sweets. Even if you are perfectly happy with the candy you can find at your corner store, you won’t be able to resist packing your bags and heading to any of these outstanding American candy shops. When most Americans think candy, they think Hershey’s. The world-famous confectioner is synonymous with creamy chocolate and satisfying sweets. However, the company’s flagship store in Las Vegas is much more than another place to buy Hershey’s ubiquitous candies; it is a sweet experience unlike any other. bakery counter well-stocked with fresh-baked Hershey’s treats, like Almond Joy cupcakes and Reese’s brownie sandwiches. Plus, the store offers a bevy of interactive displays, including one that grants the ability to design your own Hershey’s wrapper. After being shipwrecked just off the coast of Salem, Massachusetts in 1806, Mary Spencer was forced to find work that would earn her and her son food and shelter. Fortunately, Ms. Spencer was a skilled candy maker, and she soon invented the Gibralter, a hard candy that melted sensuously in the mouth. Since then, Ye Olde Pepper Candy Companie — named for the Gibralter’s peppermint flavor — has been a New England staple. Most of Economy Candy’s treats are available online, but you absolutely must visit the store for the overwhelming experience akin to — well, a kid in a candy store. Big Top Candy Shop is big, loud, bright, and busy at all times, just like the circus. The store contains more than 300 types of bulk candy and 2,000 varieties of wrapped candy, but one of the biggest draws is the shop’s old-fashioned soda fountain and ice cream counter, where trained soda jerks whip up nostalgic treats like egg creams, malts, and true ice cream sundaes. While you enjoy your fresh sweet treat, you can explore Big Top’s aisles of circus memorabilia — much of which is available for purchase. Proud to be one of America’s oldest continuously running candy shops, Shane Confectionary’s shop in old Philadelphia is decorated with Chippendale-style woodwork, stained glass, and jars upon jars of homemade sweets. Since 1911, Shane has delighted customers with some of the best brandied cherries in the country, but it also produces high-class licorice and clear toys — sugar sculptures shaped like animals. On its website, the shop graciously tips its hat to fellow Philadelphia-born confectioners Milton Hershey and Stephen Whitman. Schimpff’s Confectionary has kept secrets of their candy business in the family since 1981, and most of the candies on offer at the store are beautifully and deliciously old-fashioned. Their signature cinnamon red-hots — which have been available since the shop’s beginning — as well as traditional Polish Modjeskas and multi-flavored hard fish candy shine through quaint glass jars around the store. However, the candy is only half of the reason Schimpff’s should be on your must-visit list; the store also boasts a candy museum that is filled with decades’ worth of American candy and related memorabilia. Like Hershey’s Chocolate World, Sweet! Hollywood is as much an adventure as it is a candy store. 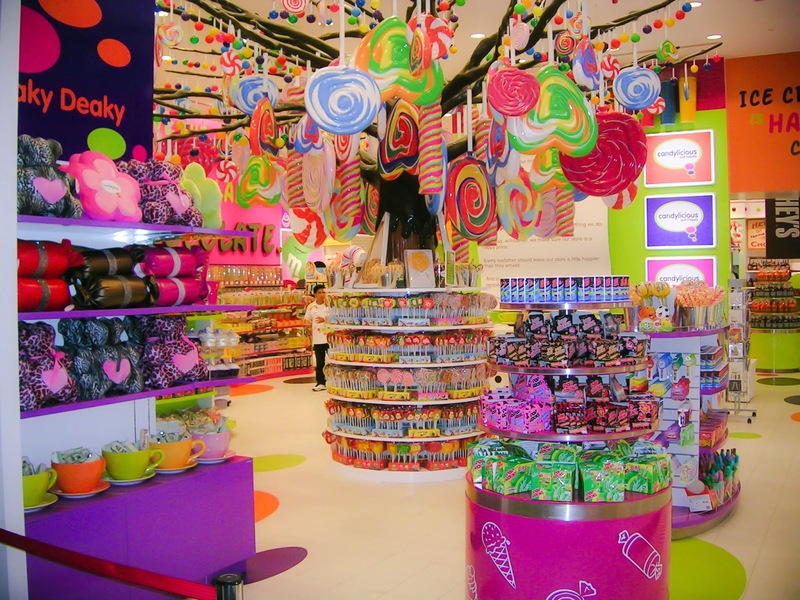 Organized into candy boutiques like a movie studio organizes sets, the shop offers more than 12 different sections of sweet opportunity. For example, in Stay Puft, you can find marshmallows of all sizes, shapes, and colors, and in Lollywood, you can find the same selection of lollipops and suckers. Tasting machines are located all around the shop, so you don’t even have to buy before you try. What candy shops have you visited? What was the coolest thing about it? Tell us in the comments below!